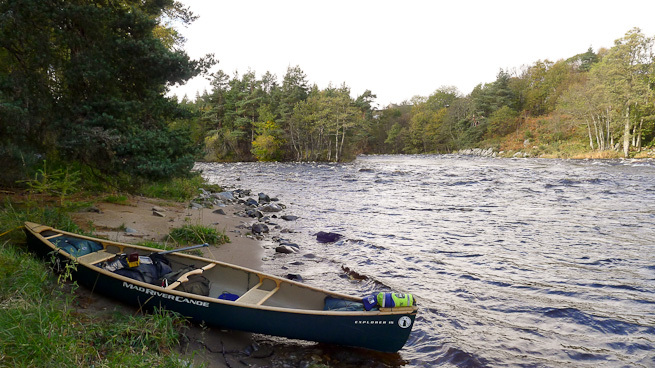 Make a real multi-day canoe journey on this beautiful Scottish river. Photo: Paul Kirtey. If you want to graduate to wilderness canoe touring there is no better way in Britain than this classic Scottish river journey. Starting at Loch Insh, in the shadow of the Cairngorm mountains, your descent of the River Spey will lead you to the sea at Spey Bay. After a day of honing your skills, you will cover 70 miles of river over the course of four days, wild camping each night. Along the way there is great paddling, beautiful scenery at every turn and an opportunity to apply a range of bushcraft skills. This is a real-world journey and it will be run as such, with the benefit of your guides' experience in making wilderness journeys. On river, the trip will be guided by Ray Goodwin, with plenty of opportunity to work on your moving water technique under his watchful eye. On land Paul Kirtley will overlay bushcraft instruction, advice and guidance. The combination will provide you with the canoeing and associated campcraft skills to venture further in an open boat along with the experience and confidence to do so. Negotiate exhilarating rapids under expert guidance. Photo: Ray Goodwin. The river will be run as per river journeys in more remote settings and all camping will be done in true wilderness bushcraft style with the use of tarps and fires. Before we set off, we will have a consolidation day on Loch Insh to prepare for the journey. Here we will be based at the Loch Insh Watersports Centre and in the evening we will discuss what to bring for the journey and how to pack it. "This is my favourite British expeditioning river. The scenery changes from day to day from the mountain backdrops at the start, to the flats beyond Aviemore and then, from Grantown onwards, the relentless onward flow to the sea through a spectacular valley. Over the years I have sampled wild camping in rugged tree covered islands and that is very much part of my Spey memories (along with a drop or two of single malt of course). The people I have paddled with and those that I have met along the way are very much part of this very special experience. 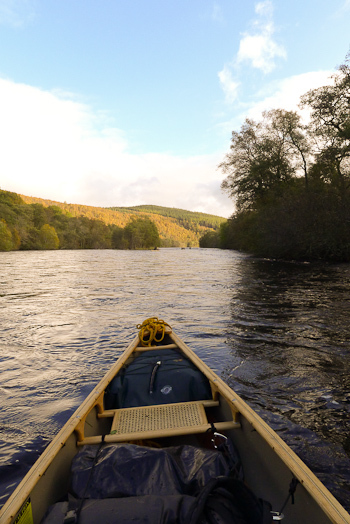 Paddling the Spey is always one of the highlights of my year". "Before the Spey trip, I was concerned about not having the skills and ability to complete this type of expedition safely. That is why we booked on the Windermere course which was great also. The expedition skills course was a great foundation for the Spey trip. Despite my concerns, the main thing the Spey trip provided me with increased confidence on the water and a decreased fear of being in the water. It was all good. The journey was great and the routine of travel and camping was lovely. Overall, for me, the additional benefits of taking this trip were getting to experience the best river trip the UK has to offer, meeting like minded people and enjoying their company, being tutored by Paul and Ray - invaluable. The expedition was truly wonderful. As I write this I miss not being on the water. I would recommend this trip in a heart beat. It was an all round great experience. " Paul Denham, Leeds, U.K.
" I have limited experience in a canoe and had not a lot of confidence in my strokes. For me, sometimes learning new subjects like canoeing does seems to take me longer. I am yet to have the "lightbulb moment" and still feel very amateur in my skill but I know if I want to take canoeing more seriously I need to commit to lessons and spend a a lot more time to learn the craft. So, the main thing I wanted from this trip was to continue the outdoors journey - learning new things and meeting great like minded people from a bushcraft specific side. In particular I wanted to improve my paddle strokes and ability (I think that happened). The thing I liked most about this trip was the final day - it was incredible, very emotional and also beautifully picturesque. Frontier have a great balance that can push you out of your comfort zone - important for life in general whilst supporting you and discussing any fears. These trips are great for preparing you for a expedition of your own - preparation, sense of humour, packing thinking and most of all safety. The sense of achievement for me when we reached the beach at Spey Bay was great; I could feel the emotion and the sense of satisfaction of achieving this. It was almost a regret to finish and on the last leg I felt myself more aware but deliberately slowing down to maximise the trip. I would absolutely recommend this trip because it offers amazing value for money and is exceptional experience. It pushes your boundaries and it's a real lot of fun!! I laughed constantly for 5 days, some out of fear and nervous energy but most because of people and journey taken. For me, that's what life is about - experiences. They are more important than any material item and stay with you for a lifetime. This is my third Frontier experience and I have to say I have enjoyed every one. Keep up the positive energy - the team is exceptional and really always makes me feel very welcome." Rob Blake, Hertfordshire, U.K.
"I am an experienced whitewater kayaker, but have not done a great deal of moving water open boating so my main concern prior to booking for the expedition was if the paddling would be within my capabilities. Being new to wild camping/bushcraft I was very impressed by the smooth and efficient way camp was set up every evening and dismantled in the morning, leaving no trace of our visit. It is clear that respect for the environment is paramount at Frontier Bushcraft. I picked up a lot of useful information with regard to good camp practice. The food provided was excellent. Eating the evening meal around a campfire in the forest made it even better. On the paddling side of the trip, Ray's advice on outfitting and packing a boat was very useful. All in all, I found the trip very enjoyable and would recommend it to anyone looking for something more than just running a river. Thanks to Paul, Ray and the rest of the team for a great week." Fred Welham, Sudbury, U.K.
"The main reason for booking this course was to improve my canoeing skills but I also I gained personal friendships with like minded people. And the camp sites on this trip were amazing! Additional benefits of this trip were spending quality time with professional people and increasing the efficiency of my firelighting. I would definitely recommend this to those who are looking for adventure and excitement. In summary, I feel I had the most amazing experience and feel exhilarated, full of adventure and ready for the next Paul Kirtley trip. Huge thanks!" 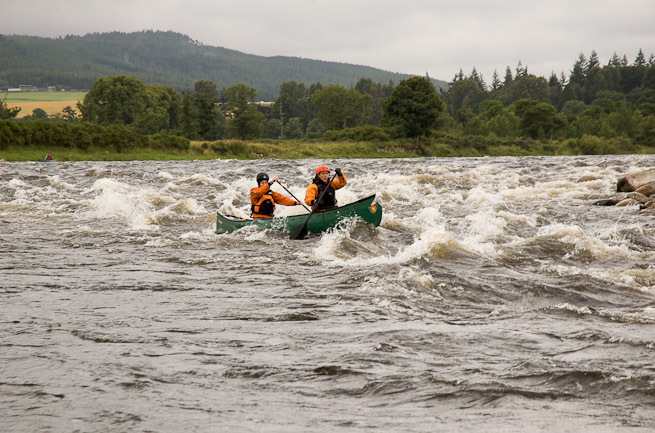 Vanessa Johnson, East Sussex, U.K.
"Dear Paul and Ray, Thank you both for a fantastic journey on the River Spey and for looking after everyone both on the river and at camp and feeding us well. The trip has given me confidence to handle the canoe in white water (especially trying out solo) and has given me the motivation for solo canoeing in the future as well as perhaps undertaking similar trips. Every aspect of your well thought out preparation, planning and execution of the trip was essential and is appreciated." Albert Joseph, Oxfordshire, U.K.
Canoes and other specialist equipment - including buoyancy aid, helmet, paddle and drybag for your kit - will be provided for your use during the trip. We will ask you for some measurements so that we can provide you with appropriately-sized equipment. We will also provide communal cooking/kitchen items. If you have your own buoyancy aid, helmet, paddles or boat, please feel free to bring them. Please let us know if you do not require the use of our equipment by writing "not required", "not applicable" or "N/A" in the sizing fields of the booking form. A full kit-list is available here. The kit-list will also be e-mailed to you with your e-mail receipt after your booking has been accepted. All specialist equipment - boat, paddles, helmet, drybag is provided or you can bring your own if you have them. Photo: Paul Kirtley. This trip will be entirely outdoors, apart from an evening session in the Loch Insh centre. We will meet at the Loch Insh Watersports Centre and stay there Sunday and Monday evenings. Accommodation is in double rooms. During the river trip we will be wild camping. On Friday afternoon there will be a transfer from Spey Bay back to Loch Insh for our group and equipment (included in trip fee). Evening meals - in the Loch Insh Watersports Centre and on the river trip - will be provided. Breakfasts in the centre (Monday and Tuesday) and on the river are also included. Lunches on the river are included. We ask that you bring your preferred snacks for the week (cereal bars, GORP, chocolate, etc.). Also, please bring a packed lunch for Monday, while we are working out of the centre. All other food is provided (see paragraph immediately above this one). While on the river trip we will cook meals communally and there will also be a communal kettle for hot drinks morning and evening. You should have paddled before and be able to use stern rudder, J-stroke, bow draws and cross draws. It would be helpful if you have paddled some whitewater before but it is not essential. The consolidation day on Loch Insh will look at preparing your technique for the river trip. Course size: 9 participants (maximum). Location: River Spey; Badenoch and Strathspey to the Moray Firth. Trip Meeting Time: 18:00 Day 1. Trip Finish Time: 16:00 Day 6. Expedition Leader: Ray Goodwin and Paul Kirtley. Back to the bushcraft expeditions page.